The Boone Fetter Clinic offers comprehensive diagnostic services and follow-up care for children and adolescents who have concerns in the areas of neurodevelopment, behavior, attention, sensory processing, feeding difficulties and social-emotional development. A multidisciplinary team comprised of developmental behavioral pediatricians, psychologists, speech/language pathologists and occupational therapists deliver services within a single setting. The Boone Fetter Clinic serves families throughout Southern California, and is committed to providing a supportive, nurturing clinical experience that is tailored to the unique needs of both the patient and the family. We also conduct research to improve early diagnosis and treatment of children with neurodevelopmental disorders, and to reduce health disparities related to child development in the diverse communities of Los Angeles. 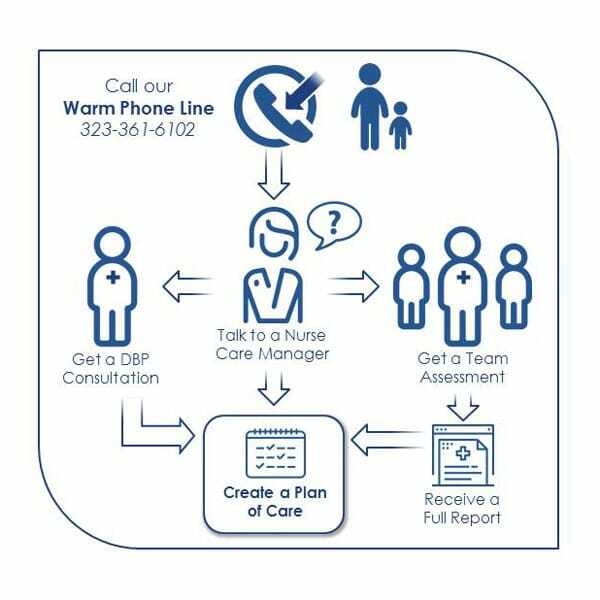 Call us to Make an Appointment: When you call our Warm Phone Line, you will reach a Nurse Care Manager who will talk to you about your child’s unique challenges, needs and strengths and help to connect you with the right services for your family. Team Assessment and Diagnosis: If you have concerns about your child’s development and need to get a diagnostic assessment, the Nurse Care Manager will connect you with our team of experts. This team will meet with you and your family over a series of visits to gain a deeper understanding of your child’s unique challenges, and create a comprehensive report and plan of care. The Nurse Care Manager will also help you create an action plan and follow up with you after 30 days. Developmental-Behavioral Consultation and Care Coordination: Depending on your child’s unique needs or existing conditions, the Nurse Care Manager can also connect you directly to a Developmental-Behavioral Pediatrician (DBP), who will work with you to create an individualized plan of care that may include follow-up care at CHLA, occupational therapy evaluations, on-going medication management, feeding therapy or other specialty therapy services. CHLA is a member of the Autism Speaks Autism Treatment Network. Participation in this national autism network allows us to provide cutting-edge care while advancing highly innovative community-partnered research in order to change the future for children with autism and their families. The Boone Fetter Clinic is generously supported by the Boone Family Foundation, the Las Madrinas Endowment for Autism Research, Intervention and Outcomes, and the Sharon D. Lund Foundation.